The testing phase of development with KRP in the CEV Junior World Championship has now been completed with great results. We have available a gearbox to replace the OEM gearbox in the 2016/17 model KTM Moto3. 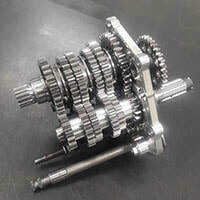 Drawing on our previous experience of our 2012- 2014 version and the Mahindra Moto3 project over the last 2 seasons, we are able to offer a number of improvements over the OEM components, including greater durability of the gears, and a reduction in shift effort for the rider, especially during the down shifting phase. Changes to the electronic shift strategy have also given reductions in the shift time. The kit consists of an input shaft assembly, output shaft assembly, selector drum and selector forks. These fit into the OEM cassette plate assembly, utilising all the OEM index, detent and neutral lock out components. Please specify which year model you require so the correct drum can be supplied. ​Other ratios may be available on request. Currently being used in competition in the FIM CEV Junior Moto3 World Championship. A full dog ring gearbox for the KTM RC250R Moto3. A large reduction in shift inertia greatly decreases the effort to shift up and down the gearbox, this gives lighter, smoother gear changes. The undercut dogs promote positive retention after each gear change. These attributes combine to give more stability to the rider and motorcycle when changing gear whilst cornering. It includes new selector forks and selector drum.